Suppose you are a company president and you are plagued with sharply rising costs related to the access of information needed to run your business. You meet with your senior managers to discuss the problem and to find a way to reduce these costs. The manager of information technology suggests a data warehouse as a solution. Perhaps youre not sure how this might address the problem, so you ask, "Why?" Unknowingly, you have just taken the first step on a path to a solution. Advanced Strategies would express that answer (the "why") in terms of intentions, values, focus, and context. (This is known as project definition. See accompanying article) We have found that, in dealing with our clients business problems, we needed something to help clarify our understanding of their true intentions. We needed a mechanism to extract exactly what they wanted to accomplishthe problem to be solvedbefore we could begin to offer any candidate solutions. 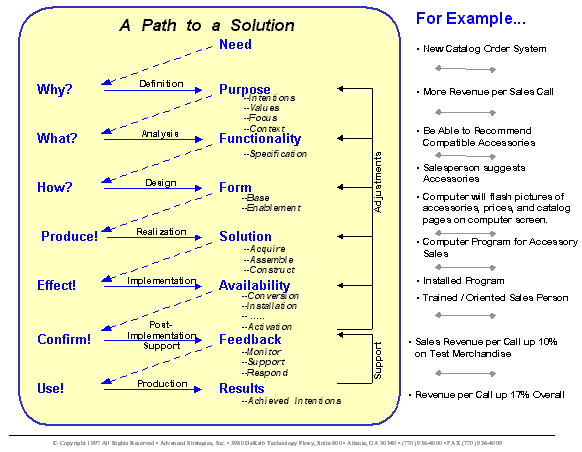 "A Path to a Solution" was developed as a logical progression of analysis processes that contribute to resolving a business (or any other type of) problem. 3. An on-going project that gets off-track will need to be re-focused on the original intentions. "Okay," you say, "explain this to me." For example, suppose a client expresses a need for a data warehouse. In using the "path" approach, we would first ask, "Why? What are the business intentions (or purposes) to be realized with a data warehouse?" By answering this question, wed have a well-defined purpose (or project definition) that we are trying to achieve. Suppose your intention is lowering the cost of accessing the information needed to run your business. The purpose, then, is not the data warehouse itself, but the cost reduction. The data warehouse was simply offered as a candidate solution; now you must proceed along the path to determine whether it is, in fact, a viable solution. What business functionality is needed to achieve this purpose, given the area of the business we are to focus on, the values that will govern our behavior, and the context within which we can find the solution? In the data warehouse example, wed need increased access to current or updated information and the reduction of duplication. We still are not defining exactly how to achieve the purpose; rather, we are determining what functionality is needed in order to achieve the original purpose. If we know the functionality, then we can ask, "How can we structure our business to use technology and other mechanisms to deliver this functionality?" This is where the data warehouse would be examined as a candidate solution. This is done in two parts: base and enablement. The base tells us how the business processes are going to be set up to deliver this functionality. Enablement indicates how technology and other appropriate means will be used to enable the base business to be done more efficiently. The combination of base and enablement gives us the form of the solution. Now that we have the form, we can begin to produce the solution. We can acquire, assemble, and/or construct the components necessary to build the form. It is not enough to produce the solution; you have to make it available for use by the intended users by way of conversion, installation, activation, or whatever other means is appropriate. And its not enough that it is available. We must also confirm that the solution is meeting its initial business intentions and purposes. In our data warehouse example, we would need to confirm that the data warehouse is lowering the cost of retrieving the information needed to run your business. If the feedback we receive at any step along the way tells us its not working, then we would want to go back and make necessary adjustments until using the solution produces results that satisfy the original intentions. There are many paradigms which may be used to address a problem. This is one path to reach a solution, and it is our preferred approach. It is generic enough for many situations while providing enough "meat" to achieve precise and accurate results. It is used to find an optimal solution when you can consider any solution. Although it may not be the quickest or simplest solution in some environments, we have found its great advantage is that it always works.